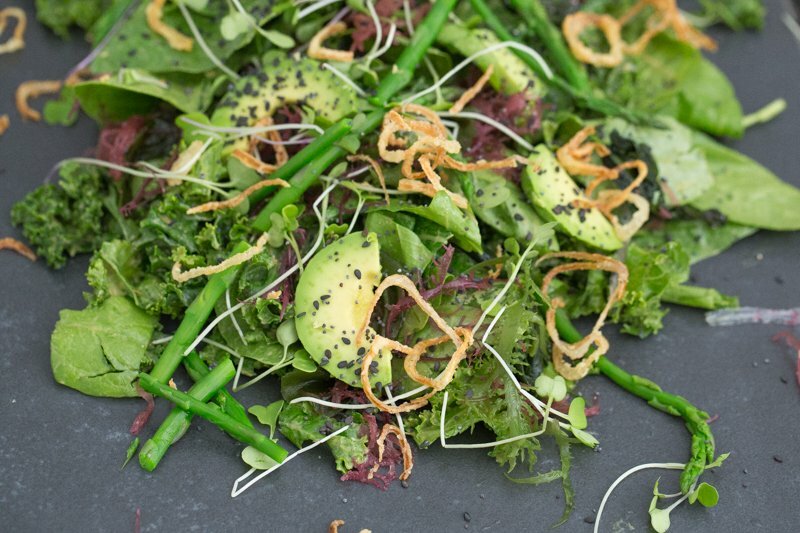 This scrumptious salad tosses healthy greens in a tangy ginger & wasabi dressing, and garnishes with asparagus, avocado, radish sprouts, sesame & hemp seeds. We can’t get enough of it! Raw kelp is fabulous to incorporate into your diet — it’s rich in calcium, magnesium, iodine, and Vitamin B12). Feel twice as good, since you are fighting climate change with seaweed! Kelp requires no fertilizer or freshwater to flourish, it eliminates climate-warming CO2 from the atmosphere, and it counteracts ocean acidification. You can always “have greens on hand”, even when your fridge is bare since reconstituting seaweed is a snap! Just soak it in water for about 5 minutes, and it’s ready. 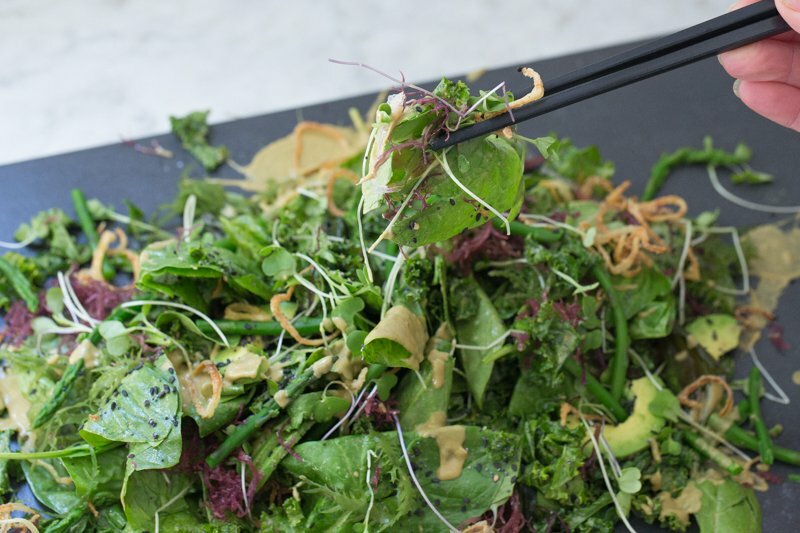 Make the salad dressing by adding the ginger, wasabi, vinegar and soy sauce to a blender and whizz. Add the oils in a slow, steady stream with the motor running on low. Taste and adjust the seasoning. The squeeze of citrus should really take it over the top! Liberally dress the spinach and kale with the dressing and mix well. Place on the serving plates and then add the sea greens, asparagus, and avocado on top. Garnish with the sprouts, and sprinkle with the seeds and shallots. Peel and slice the shallots into thin rings. Mix the flour with plenty of salt and pepper, and coat each shallot in the mixture. In a small pot or pan, heat the oil until sizzling. 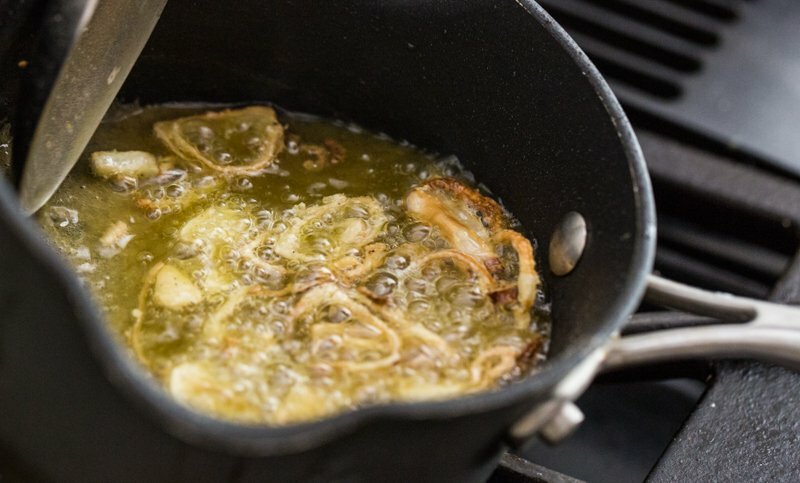 add the shallots and fry until crispy, about 3-4 minutes. Drain and blot any excess oil using paper towels, and sprinkle on the salad.